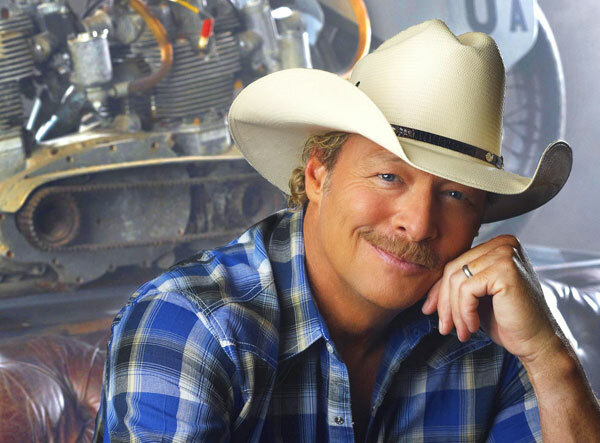 An old frame house, willow trees, a dirt driveway, a small garden – these are images that were ingrained in Alan Jackson as he grew up near a stretch of road known as the Dixie Highway. Those images have provided the origins for some of Jackson’s biggest hits – songs such as “Livin’ on Love,” “Home” and “Chattahoochee.” They’re memories so vivid that they remain a source of inspiration on his latest album, Thirty Miles West. Jackson has traveled far more than thirty miles from those small town beginnings in Newnan, Georgia – his music has taken him to the floorboards of the Grand Ole Opry, CBGB and Carnegie Hall, to stages as distant as Australia and Scandinavia, to performances in front of four Presidents. He’s written and recorded songs that have celebrated and chronicled life since “Here in the Real World” put him on the map, finding himself in the elite company of Paul McCartney, John Lennon and Merle Haggard as the only songwriters who’ve written and recorded more than 20 songs that they’ve also taken to the top of the charts. And his trek continues with the 13 songs that comprise Thirty Miles West. I grew up about thirty miles west of the official part of the Dixie Highway that runs through Georgia,” Jackson says of the album title. “This highway has been in existence for forever now – it runs from north of Michigan all the way down to South Florida.” A song penned by Jackson called “Dixie Highway” re-connects him with fellow Georgian Zac Brown. The two paired up a couple of years ago when Brown invited Jackson to sing on “As She’s Walking Away,” a song that would win awards and accolades, including a Grammy. Their voices and musical style fit like a hand-in-glove then, as they do here, trading memories and images of rural life that could exist virtually anywhere. “To me country music’s about being in love, having your heart broke, drinkin’ and partyin’, livin’ and dyin’, family and where you grew up,” Jackson says. Nearly every one of those life-lessons is here, each brought to life by Jackson’s rich and seasoned vocals. Each song sounds as though he’s lived it or witnessed it. And, in most cases, he has. Thirty Miles West opens with the strains of a fiddle as “Gonna Come Back as a Country Song” takes the listener to the very sort of honky-tonk bar where Jackson got his start. You sense you’re someplace familiar, someplace that you “belong.” And then the stories begin to unfold. To live life is to experience all of it, though, and that includes an inevitable taste of heartache. In “So You Don’t Have to Love Me Anymore,” the emotion is raw, the message clear and simple – the understated sensitivity packing more of a punch than any loud tirade ever could. In “She Don’t Get High,” there’s simply no spark left in the relationship…while “Look Her in the Eye and Lie” finds Jackson offering counsel to a man going through a breakup. If images of small town life in rural Georgia still provide inspiration for stories and songs, so does the young woman Jackson met and fell in love with at a Dairy Queen in his hometown. Jackson’s wife Denise was diagnosed with cancer in late 2010, and though she currently celebrates a clean bill of health, the impact of the scare resonates with stark clarity and chill in “When I Saw You Leaving (for Nisey).” The song is also a testament to true love…and we are allowed a glimpse of a very intimate place…witnessing much of what has made Jackson the man, husband, parent, and storyteller he is today. The road that runs through that small Georgia town west of the Dixie Highway has taken Alan Jackson away to places he never ever dreamed he’d see or experience. While the saying may be “You can’t go home again,” Jackson’s music is proof that that you don’t take the small town raising out of a man, which is evident on Thirty Miles West – a journey that’s heartfelt and genuine, shared by a voice rich and resonant with sincerity and emotion.